JAL has updated the seat maps for their inaugural 787 Dreamliner route – Boston to Tokyo – and is showing off one of the more interesting cabin configurations I’ve seen in a long time. 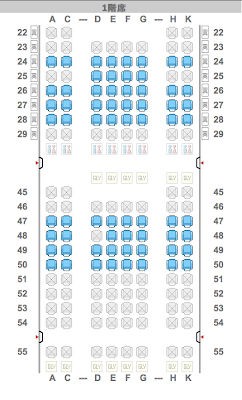 The Business Class cabin is reasonably normal with 7 rows of 2-2-2 seats. And the economy cabin will be similar to the ANA cabin with a 2-4-2 configuration and 144 seats, roughly 40 fewer than North American launch customer United Airlines will be putting in the same cabin. But that’s not the interesting part; it is the row layout that is unique. There is a row of seats all the way at the back of the plane, just in front of the rear-most galley. Extra exit row seats – albeit the last folks to get off the plane – means potentially more seats with extra leg room. Always nice to see that sort of option showing up. A hat tip to JALPak for noticing the new seat maps coming online. But do the seats in that last row recline? I’ll take legroom over recline every day of the week, Mark. With united ordering 50 dreamliners. CEO says people will want to fly united to experience it. But, only if they receive great customer service. How does that happen when the agents were handed a 30 plus year old computer system?? ?